While we will do everything in our power to make your trip as safe and enjoyable as we can, there are challenges implicit in travelling in the world's mightiest mountains that we could not remove if we wanted to. While the roads we're taking are in pretty good condition, the Himalaya is still growing and collapsing – possibly overnight and across our route. Nepal also throws up some extra logistical challenges due to its ever-shifting political landscape, as road-closing strikes can sometimes occur. For this reason, no itinerary is ever set in stone. This tour will be run on two dates and in two directions (Bardia to Kathmandu and Kathmandu to Bardia), with internal flights supplied by Blazing Trails. On arrival in KTM, depending on which direction you are riding the route, you will either be transferred to the domestic terminal for your onward flight, or to your hotel in Kathmandu. On meeting up with the Blazing Trails team you be given a full briefing on the joys ahead, handed 'your' bike, an Enfield Bullet (with a front disc brake fitted) and given instruction on its eccentricities. Whenever riding there will be a leader and 'outrider' guiding and trouble-spotting. A 'sweeper' rider, a support vehicle with spares and an extensively-equipped medic will travel at the rear. The trip includes some long days in the saddle, both on easy cruising roads and very challenging mountain chicanery. These day-long rides will require skill and concentration, so we ask that you have a minimum of two year's riding experience before taking on this tour. There will be little traffic, but that which we do encounter is likely to be behaving 'erratically'. The general condition of the roads is, however, very good for this part of the world. Nepal has recently (2006) emerged from a long internal conflict. Although the country is now largely stable, there are still political problems. These generally manifest themselves as 'bandhs', general strikes that can close the roads. Tourists, however, are generally left out of local disputes as it is understood that the welfare of the tourism industry is critical to the country's foreign exchange, being its biggest earner. Weather will range from 'warm' on the plains, to 'nippy' in the higher stations. We would not expect rain at the times of year that we run tours in Nepal, but it's always possible. Nepali jungle and Himalayan valleys; views of the Annapurna and Everest ranges – this is a trip full of fabulous contrasts and epic rides. Nepal's recent past has been a turbulent, intriguing and bloody. More than a decade of insurgency by Maoist forces against the ruling monarchy cost over 11,000 lives, before the warring left-wingers and royalists laid down their arms and in 2006 agreed to move toward democratic elections. The Maoists won, formed a government (now dissolved) and dethroned the less than popular King. Having turfed out the monarchy, the parliament's next major job was to thrash out a new constitution – a process whose deadline is expired. There remains tension over this and other issues, usually manifesting itself in 'bandhs' (paralysing strikes). Nepal is a landlocked country, a little larger than England. It is bordered to the north by occupied Tibet and all other sides by India. For such a small country, Nepal is incredibly geographically diverse. Eight of the world's ten highest mountains rise from Nepali territory, including of course the biggest of them all. The south of the country, on the edge of the Indo-Gangetic Plain, is just a few hundred feet above sea level (abv). Thus, the mountains that cover two-thirds of Nepal rise incredibly steeply and it's possible to be standing at 300ft abv, looking up at the summit of Annapurna 26,500ft abv. The southern plain is known as the Terai and covers some 20 per cent of the country. It is geographically identical to much of northern India, but has suffered from less 'development'. Once a malarial swamp, there is much pristine wilderness. It is while in this area we will visit the wildlife reserves. 'Nepali' is the official language, with around 60 per cent of people using it day-to-day. English and Hindi (to which Nepali is similar) are widely understood in places visited by tourists. The Nepali Rupee is not an independent currency, but is linked to the Indian Rupee at a rate of 1.6 Nepali Rupees to each Indian Rupee, making it incredibly good value for visitors. Land in KTM following an overnight flight, to be met by a Blazing Trails representative and transferred to the Domestic Terminal to meet your flight to Nepalganj, from where you will be collected and driven (around 2hrs) to our jungle resort on the fringes of Bardia National Park. Here you will be greeted by our staff and briefed on the trip ahead. More on Bardia. We will be transferring to rafts, which will carry us through the park to the most surprising of overnight stops, a camp on a riverine island, deep in the jungle. The evening's entertainments are best left a surprise. This National Park is one of Asia's great secrets, situated as it is away from the usual tourist circuits. The park holds tigers, leopards, elephant, great Indian one-horned rhinoceri, crocodile and many other species. The journey back from our overnight camp to the hotel near the park gates can be made either on foot, or by raft/jeep. It's a stiff half-day on foot, but worth it as it's rare to be allowed to walk in such places and the chances of seeing wildlife here are high. This is a long ride – around 200 miles. After leaving the park's rough roads we're back onto the Mahendra Highway. Most of the ride is fast and smooth, but towards the day's end we will turn off into the hills and begin a steep climb, which ends in the charming and historic regional capital of Tansen. Our hotel has great views all the way to Annapurna and there's a fantastic restaurant in town. More on Tansen. A half-day of twisty, twisty, twisty riding, through huge gorges, with rivers frothing beneath us and stunning snow-peaked Himalayan vistas opening up along the way. We should be in Pokhara in time to spend the afternoon checking out Nepal's second largest city. Pokhara is a trekker Mecca, from where those without engines head out for the 'Annapurna Circuit' trek. Many also take the opportunity to do a tandem paraglide, with the huge mountains as a back-drop. Due the the city's popularity with adventurers, there is a very lively nightife on offer, with live rock bands and hundreds of resaturants and bars from which to choose. From the Lakeside area in which we will be staying it is possible to see most of the Annapurna range on a clear morning. A day to do some boating on, or take a walk beside, Lake Phewa, over which our hotel looks. For the more adventurous, it is also possible to go paragliding in the most majestic of settings (we would advise that you book your flight the evening before). For the less energetic, there is also plenty to do, like shopping, eating and drinking. More on Pokhara. The morning's ride gets curvier and more interesting by the hour as it follows the main Kathmandu road through scenic river gorges. Turning off the main road, we will follow the road up to Gorkha (after which the famous 'Gurkha' Regiment takes its name). The afternoon can be spent visiting some very important Hindu temples and scaling 1700 steps to the palace of King Prithivi Narayan Shah, the founder of `Shah Dynasty' which ran Nepal until recently. Around 300 years ago, he unified the 50-or-so states that comprised the area that is now Nepal into a single country. More on Gorkha. A late-ish set-off will allow those who want to explore Gorkha more time, before we wind down from the hills and back to the Terai plain, some 500km east of where we started. The aim is to hit Chitwan before sunset, so we can park ourselves in the most appropriately-named Sunset Bar to watch the event. It is not uncommon to see a rhino cross the river with a beer in your mitt, illuminated by the most spectacular of sundowns. Chitwan is a little more developed than Bardia, but is still incredibly beautiful. It is possible to indulge in rhino-tracking on elephant-back and you have very good odds of seeing one of the horny fellows (the picture here was actually taken near the riverside bar), plus many smaller creatures. The tigers and leopards in this park are much rarer sightings. There are also opportunities to walk in the 'buffer zone', take boat rides and visit local Tharu tribespeoples' villages. Once you have finished with your activities, sidle down to the riverside again, where you will doubtless find the BT staff down by the river watching the sunset, glasses in hands. An early start is needed as we've much ground to cover. The day will start with knocking out a few kilometres on the fast Mahendra Highway, before we head back into the hills for what is one of the most spectacular rides imaginable. 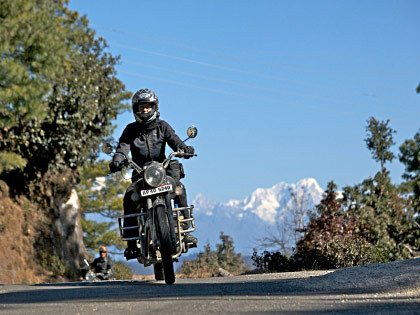 We will climb and climb a twisty and near-deserted road until reaching the top of a pass at Daman (2600m) for lunch. From here, the views open up all the way to the Everest massif, hundreds of kilometres away (pictured left, through a 200mm lens). The ride down the other side is no less incredible, this time the Annapurna Range supplying the vistas. And then again we climb (though on a rough and busy road) to a small pass that is the gateway to the Kathmandu Valley. To reach Nagarkot means travelling a few kilometres on the Kathmandu ring-road, from where our hotel is but a short ride up to 2175m. More on Nagarkot. Early risers will get the chance to see sunrise striking the Everest Range, before we head out after an early lunch. Today's roads and views are again stunning, as we head north-east, closer to Tibet and the Everest region on the Chinese-built Arniko Rajmarg (Friendship Highway). We should reach our tented resort, set besides the Bothe Kosi River in the early afternoon. More on the Arniko Highway. A day in which to engage in bonkers activities, or just chill. Possible foolishness includes bungee jumping into a 160m gorge, white-water rafting and canyoning. Less adventurous types may instead opt to relax at the resort with a massage or in the sauna. Another option is to take a ride 20km up to the Kosari Bridge, the centre of which is the border with Tibet. More on The Last Resort. A reverse of yesterday's ride will take us back in the direction of Kathmandu. Some 25km short of the capital, we will be stopping for the night in Bhaktapur, one of the three cities in the valley. Packed with historic, religious and cultural (World Heritage) sites and sights, a fine afternoon can be spent investigating the squares and temples. More on Bhaktapur. Up early to catch the short bus-ride bus from Bhaktapur to our hotel in the Thamel district of KTM – where most of the climbers and trekkers hang out. Spend the remainder of the day exploring this amazing city. There are several large temple complexes, both Buddhist and Hindu on the city's edges and Durbar Square (a UNESCO World Heritage Site) is just half an hour's walk from the hotel. Every street of central Kathmandu is full of shrines, shops and unusual sights. If you want to buy dodgy-quality, moody outdoor gear, then Thamel is the centre of the universe. Kathmandu also has a huge number of eateries to choose from, with good Continental cuisine to back up the local fare. Later in the evening you should be able to track down a busy bar with live music. More on Kathmandu. Relax on an aircraft, savouring memories and accidentally deleting pictures of the jungles, mountains and towns that make up fascinating Nepal. Bask in the satisfaction that you have ridden some of the best mountain roads in one of the world's most interesting countries. And what a bargain! Despite the ongoing peace process, the political situation in Nepal remains a little fragile. Problems involving tourists are extremely rare, but we will be monitoring the security situation on an ongoing basis and an alternative itinerary will be put in place if we judge the situation at the time to be too dangerous. For current Government travel advice, check: Foreign Office Website. You will need a passport with valid visa, appropriate travel insurance and an international driving permit. While visas can be obtained on arrival, the queues can be long. Better to get a visa from the Embassy of Nepal in London. The Nepali Rupee (NPR) is fixed against the Indian Rupee (INR) at an exchange rate of 1.6 NPR to each INR. However, the daily price given by foreign exchange wallahs in Kathmandu, is set as a cartel and you'll have difficulty getting the full rate. Thus, we would suggest you check the rate before flying, so you do not get ripped off at the airport. In the major towns (Kathmandu, Pokhara and Chitwan), there are cashpoints and any hard currency (UKP/USD/Euro) cash is easily changed, as are travellers' cheques in these currencies. If you don't go crazy in the shops, then changing around £350 should see you through the trip. Please, though, check out (above) the cost of any additional activities in which you wish to participate. Even at moderate altitude the Himalaya can be surprisingly warm in summer. But nothing can be taken for granted and although rain is rare there is always the chance. Evenings can get quite chilly, but the rest of the time it should be warm/hot. The maximum temperature likely to be encountered is around 30ºC; the minimum 6ºC (rarely, at night). We advise riders to consider their kit in terms of layers. Good quality gear can also prevent a minor spill causing a trip-ruining injury, so we require that you ride with no exposed skin (except your face). More on kit. While you don't have to be an athlete to join us on this adventure, we would not recommend this tour to those who cannot, for instance, climb a flight of stairs. Please note that there are some long days in the saddle. We do not reach any great altitude on this tour, but if you have any existing medical condition, please consult both Blazing Trails and your doctor before booking. To visit Nepal you will need to obtain a valid tourist visa. Your passport must have at least six months of validity remaining at time of application. Visas are available on arrival at Kathmandu Airport, but the queues can be very long. Better to obtain your visa from the Embassy of Nepal. Currently a 15-day visa costs �20. We would advise that you have some idea of the Nepali Rupee exchange rate before you leave, to avoid getting ripped-off. We would advise changing around �100 at the airport. In many major towns, there are cash-points that will accept major credit and debit cards. In Kathmandu and Pokhara you will be able to use money changers and banks. Further advice to this will be given in the tour briefing. Yes (full price, less �300), but please be sure they know what they're letting themselves in for: some long days in the saddle, bumpy roads and, in the mountains, some pretty shocking drop-offs. We have limited space in our support vehicles, so pillions may not be able to hop off on a whim. Likewise, if riders have any doubt over handling the extra weight, then we'd advise they ride solo. It is possible to book a place in a support vehicle (full price, less �300) for those who want to join the tour, but not to ride or travel as a pillion passenger. Jungles, mountains, culture and wildlife, via some stunning, twisty roads. Roads are mainly good, with very little traffic. Climbing the pot-holed road to Kathmandu and following the ring-road can be challenging. Two long days in the saddle. Longer days and tougher sections are manageable and the support vehicle is there if you need a rest. Hotels are clean and in the most fitting locations we can find. Dining is tasty and extremely inexpensive. Included meals: all breakfasts; 1 lunch; 2 dinners. The bustling streets of Kathmandu; rafting and on-foot safaris into wild Bardia National Park; tribal village visit; historic Tansen and a traditional meal; shopping, nightlife and paragliding in Pokhara; temple visits; ride and wash elephants; ancient Bhaktapur (World Heritage Site); Tibetan (Chinese border visit; world's longest canyon/bungee jump.